This is a lovely, romantic, ground floor, beach front, affordable condo, off the beaten tourist path but convenient to most of the island. We just completed a major remodel October 2017. If you miss the way Maui was decades ago, or wonder what it was like, this is as close as you can get. 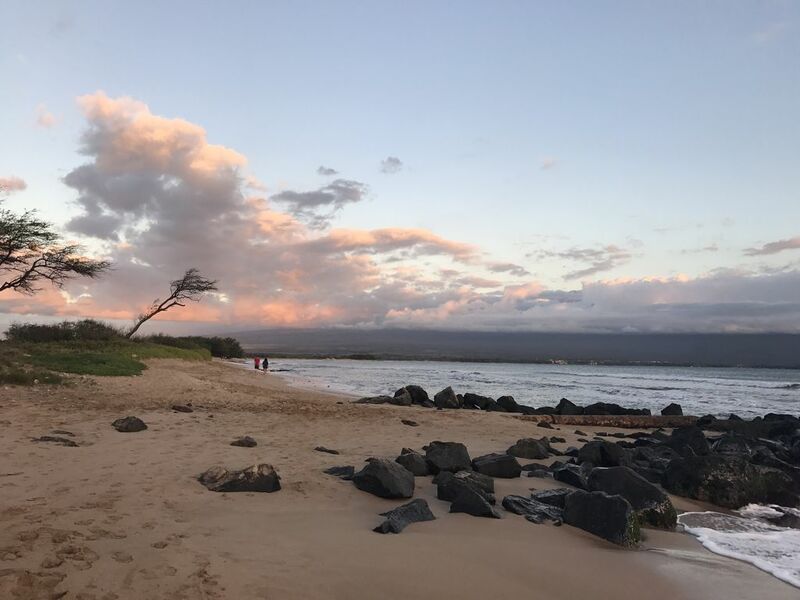 In your early morning walk along the beach, you can watch the sun rise from behind giant Haleakala while cute little sand crabs scurry in and out of their holes (pukas), turtles bob and feed, outrigger canoes paddle by, and (late December to early April) whales play. Wading birds call to each other from the nature preserve ponds behind the dunes, and occasionally you can see rays or a monk seal. It's hard not to just keep taking pictures! It's gorgeous other times of day (and night) too! In the other direction, out of sight, but an easy walk down a pretty little country lane with condos and ocean on one side and trees and cane fields on the other, is a small village, a cute little harbor filled with boats, a well-regarded aquarium, the Pacific Whale foundation, miniature golf, and a few shops and restaurants. A latte is always welcome from the General Store while watching for whales breaching. Regular golf courses are just a few miles away. This is a good sized, ground floor condo we just purchased March 2017. (We've owned our other listing, VRBO 152519 just up the street at Maalaea Banyans about 26 years.) There is a King sized very comfy bed in a pretty, jungle-view bedroom, and a queen-sized sofa bed (new foam mattress) in the living room. It's perfect for 2 people, fine for a couple with 1-2 children, and could work (but is not ideal or particularly recommended) for 2 very compatible couples. You can eat at the high table inside or the one on the lanai and see across the ocean to the South Maui coastline in the shadow of Haleakala. We are unit A9 in Makani a Kai, which means "Sea Breeze". The complex is small and friendly, and village-like (not boxy). There is a nice pool and BBQ's with outside tables nearby. The lounge chairs along the ocean are perfect for sunning, reading, or a relaxing happy hour. The landscaping here is amazingly lush, tropical, and gorgeous! SMOKING IS NOT ALLOWED in the condos or anywhere in the complex except out by the dumpster where the parking lot meets the street. We just repainted, and added new quiet efficient fans and separate air-conditioners in the living room and bedroom. (and a screen door in case you like old fashioned cooling) There is a brand new 55" UHD 4K TV and cable and wifi in the living room. There is a a full kitchen including espresso maker, coffee maker and teapot, and one bathroom with walk in rain and regular shower. Our major kitchen and bath remodel was completed October 2017. We supply beach chairs, tatami mats (great to keep your towels clean when lying on the beach), beach umbrella, beach towels, some snorkel stuff, boogie boards, etc. Please let us know if there is anything else you need, and we will try to accommodate you if possible. There is a laundromat steps away on site. We are not an ADA unit. But if you have a family member in a wheelchair, and need more than one condo, there are 2 very nice, well equipped and popular ADA units (which we do not own or manage) in our small complex (A2 and A12) . In addition to this ground floor one bedroom, one bath condo, our son and his wife have a 2 bedroom, 2 bath condo (B12) right over one of the Makani A Kai ADA units, and our daughter and her husband have a 2 bedroom, 2 bath unit (B4) at the front of the property. We also have a beautiful one bedroom one bath unit in Maalaea Banyans about 150 yards up the street. (VRBO 152519) So 4 available condos in all. We've found that separate condos, and separate cars are a wonderful way for family reunions or groups of friends to have togetherness without too much togetherness! We do give a discount if you book more than one of our family's condos. We and our kids have wonderful memories of them growing up coming to Maui, and now we are busy making memories of their children doing the same thing. We invite you to make some Maui memories too. You will absolutely love it! If we had a motto, it would probably be "This is not a dress rehearsal." We love to travel often, but inexpensively. Almost every year we took our kids out of school a month or more to travel, and now that we are retired, we are spending more time on Maui, fixing up this new condo, and traveling as much as our health and being with the grandkids allows. Still some bucket list places we haven't gone and old favorites to see again! We just visited Myanmar Jan. 2018, and highly recommend it! The horrible mess with the Rohingas is from the military government and the lovely Myanmar people have nothing to do with it and need your business! We used and loved Lets Go Myanmar, whose motto, "Don't worry, just come" was quite true for us. Maui the way it used to be. When we first came to Maui thirty-some years ago, we were blown away by how incredible a place it was: Gorgeous colors; amazing views; tiny villages with all local stores (no national chains except a Sears in Kahalui); 2 lane uncrowded country roads; miles and miles of nearly empty gorgeous beaches; no crowds, traffic, or hassles, but really everything you needed. Don't get us wrong. Maui is still magnificent. And shopping is certainly easier and cheaper with Costco and all the other big stores. But with Maui's population more than doubling since then, not all the changes can be for the better. We can't undo those changes. But we've found a place which has barely changed for decades (and then for the better--a cleaned up nature preserve, tons more turtles, and almost no seaweed, because the turtles eat it all!). It still feels like the Maui we love and remember. We walk along a quiet narrow tree-lined lane to a little village with a cute harbor, an aquarium, and a few small shops and restaurants. The other direction is a little park where local people fish, picnic,and sometimes camp, and a gorgeous 3+ mile long, nearly deserted beach, backed by the shallow ponds of a nature preserve. And even though it is off the beaten tourist path, it is incredibly convenient to almost everywhere you're apt to want to go. 15-20 minutes to the airport, Costco, or Kihei, 30 minutes to Lahaina or Wailea, about 40 minutes to Kaanapali or Napili. If you prefer big resorts or lots of touristy hustle bustle, you can easily find that from Kaanapali to Kapalua, and Kihei to Makena. Definitely not in Maalaea. But we really love what you do find there. We are really enjoying Makani A Kai. The lush tropical landscaping is outstanding, there are only 24 village-y, non-boxy units, and being right on such a long, empty, wonderful beach is fabulous. If someone in your group is fairly sedentary, you may prefer our third floor (there is an elevator) fantastic views from the lanai, Maalaea Banyans unit 150 yards toward the village (VRBO 152519). If you prefer ground floor or love being right on a long marvelous beach, with nice but less spectacular views, this might be the better choice. Aloha! Have a wonderful time! Maalaea still has the rural feel almost all of Maui had 20-30 years ago. We love it! But if you prefer big resorts, or tourist hustle-bustle, choose Ka'"anapali to Kapalua, or Kihei to Wailea. Maalaea Village is a nice walk, a few hundred yards down a pretty lane with ocean and condos on one side, and trees, sugar cane and mountains on the other. Our beach is one of the longest, most beautiful, and most deserted on Maui. We absolutely love it and walk it almost every day we are there. There are pretty Kealia ponds and wading birds like the B&W Hawaiian stilt with yellow legs in the nature preserve behind our dunes. But you have to walk a little down our beach to see them. From our lanai, behind the ocean, you see huge "young" Haleakala, the House of the Sun. From the parking lot and across the street, you see beautiful, older, eroded West Maui. Both lovely. We are on an extremely pretty part of an extremely pretty island. Gorgeous! It's hard not to keep taking pictures! Maalaea Banyans, 150 yards toward the village, has its own little beach, and Hono Kai is on the end of ours. The other Maalaea condos are on seawalls or rocks, except those right on the harbor. and espresso maker and teapot. My wife and I stayed in this property Feb 14 - 27, 2019. The location is perfect. Wonderful quiet beach just a few seconds walk away!! The recently renovated unit has everything one needs - including a washer/dryer! The owners are very welcoming, friendly and helpful. We would definitely stay there again!! The photos don’t quite do this unit justice. It is well appointed, freshly renovated, and very comfortable! The owners have truly thought of everything to make vacation easy and comfortable. We loved walking Sugar Beach in the mornings - it truly felt like a private beach! The central location on the island made it very convenient for our other adventures. We would certainly recommend this spot to others and would gladly return! Condo unit is probably the best one in the complex. Tastefully updated with beach and ocean views. We will definitely be looking for this listing for future trips. I had a great time on my first trip to Maui. The condo was very clean, with lots of updated emenities. It was so convenient to have chairs, an umbrella, boogie boards, and all kinds of snorkel gear for us to use. The beach was literally steps away and we saw a ton of sea turtles there. I would definitely stay at this condo again. Nice beach, walked every morning, grounds were beautiful, condo was very nice, could have one more easy chair for the 3rd person, only one small couch. Only down side is the floor, ceiling is very thin, lots of noise from the upstairs. Park next door gets busy on weekends and locals camp, but nothing horrible. Great location, minutes to Kihei, overall a nice stay. We were extremely impressed by the condo. John has included pretty much everything you would need for a great stay even if you come straight from the airport. Coffee, sunscreen, beach towels, and all sorts of other essential goodies. Good early morning snorkeling right out front if the waves earn't too big and some bird-watching in the park/reserve right next door. Thanks for a very comfortable and affordable stay!